I live in a flat in the very center of the city and my motorbike sleeps in the street – that is one of the reasons I bought a second hand one and not a brand new top of the range GS – so the logistics of the trip are not easy. I cannot work on the bike there nor, for that matter, walk up and down the stairs of my apartment with all the equipment I need and strap it to the bike one or two things at a time – it might get stolen while I go back up to get the rest. So when I need to service it or install things, as I have been doing these past few months, I use my parent’s place. They live in a nice big house 30 minutes away from my place and have a front yard I can roll the bike into and work in it, so on Friday morning I attached the panniers (which can be locked) at home and then took the tank bag and rack bag down the street and off I went. At my parent’s I removed the top case, which I am not taking on the trip, installed the tire rack I had made the week before, strapped the tires in place, put the bike cover and the food bag inside the tires, strapped the rack bag on top of the tires and attached the jerrycan, chain cleaner, oil and water bottles to the panniers. I ran into the first obstacle right outside my parent’s gate. A new school is being built right across the street, and construction work is almost done, so the enormous crane they were using had to be dismantled, and can guess which day they had picked to do so? That’s right. Friday. When I arrived there was this rather big telescopic crane truck parked in front of the gate, but as they had not started work yet, I was able to ride onto the sidewalk and into the yard. Now, however, they seemed to have finished lunch and got down to it, and the crane had rotated to start lowering the sections of the other crane and its huge counterweights were barely half a meter from the gate. I started work in half an hour, so I had to find a way out of there or I risked a bunch of unhappy students, and they’re not kids but workers from a pharmaceutical company. Fortunately, the counterweights were quite high and there was just enough space under them for me to back the bike out, turn and ride on the sidewalk between the truck and the houses while they were moving. The reason I was going to work with a fully loaded bike was, again, logistics. I work on the outskirts and finish at 10 pm, and on top of that I was spending the night at my girlfriend’s, who also lives away from Barcelona, and hitting the road early on Saturday morning. As I did not want to have to get up at 5 am or set off rather late, this meant taking everything with me on Friday. Well, that would be the first test – leaving the bike out in front of my work and see if anything got stolen. Fortunately, nothing did, not at work and not during the night, and at eight o’clock on Saturday morning I was ready to leave despite the rain… when it dawned on me that the bike’s documents were in the top case in my parent’s garage. Damn. An hour later I was on the motorway, happily leaving the city behind. I had the documents and the rain had stopped, it even looked as if the sun might come out. I had not solved the driving license issue, mind you, but that was something I already knew – I had had the bike for two years, ever since I got my license, but as it was my first license, it was an A2 type, meaning I could only ride bikes up to a certain power. Mine was limited and I wanted to have it derestricted for the trip this summer, so I had taken the course a week before. At the end of the course they took my license and was told I would have the new one in a week… but I didn’t. It looked as if I was going to have to take the risk and go away for the weekend without one. I wanted to test the camping and cooking gear, and the GPS, into which I had programmed the route using BaseCamp, but most importantly, I wanted to see how far I could ride on bad roads before I got tired and whether I would be rested enough to ride back the following day, so I soon left the motorway and headed for smaller roads; just past Igualada I took a smaller road heading for Santa Coloma de Queralt and Poblet. I knew this bit of road, and I knew which way I wanted to go – there are a lot of backroads – so I had programmed several waypoints into the GPS. I was surprised then to find that it did not seem to know exactly where it was going… I have never really liked these devices, and have never owned one until now. I considered I needed one to make the best use of the excellent waypoints Walter Colebatch from HUBB has complied for Northern Asia, but I have always preferred to rely on a good old paper map. I had to stop several times to correct it, selecting the next waypoint manually instead of letting if follow the whole route. I changed some settings and preferences and eventually got it to work. I admit that it was probably my lack of experience with the device that was to blame, but I did not find it intuitive to use at all. On one of the stops I made I put the thermal lining back on the jacket as it was quite cold even if it was not raining. I had stuffed it under the lid of the left side pannier, together with a the pants lining and pair of winter gloves for easy access. They will stay there for the trip. Past Poblet the road began to climb and wind its way to Prades and I was starting to have fun. The bike handled really well despite all the extra bulk, and it did not feel underpowered on the way up. I rode south-east along the Serra delMontsant, enjoying the wonderful views and the empty roads, and on the way down to Falset I spotted a big extension of empty clear land to the left of the road. Thinking it would be a good place to start practising my off-road riding skills, I pulled by and rode into it. The ground was a combination of gravel from the road construction, mud and some small bushes. I rode into it and the front of the bike slid a bit, but unlike the last time I had tried to ride on conditions like this, I relaxed me arm and let it do its thing, opening the throttle slightly to keep it straight. Even fully loaded and on road tires, it behaved well, inspiring confidence. Obviously, I was not going to charge down dirt tracks at 100 km/h as if I was taking part in the Dakar rally, but I felt confident I could travel on dirt roads for longer distances, the plan was to take the trip easy, anyway. 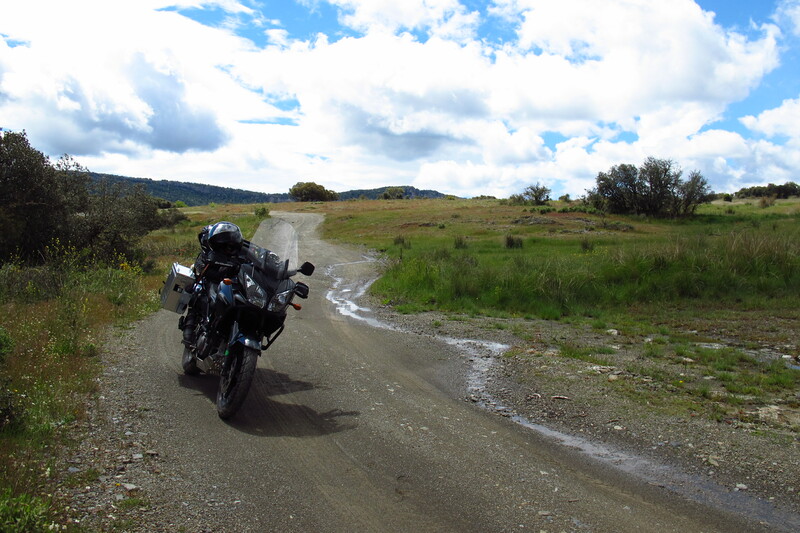 By midday I rode out onto a main A-road and followed the Ebro river up to Flix and Ascó. The weather had held and by now it was even a bit sunny, so I decided to stop for lunch and see if the old second hand Coleman stove I had bought on-line worked. I found a nice picnic area by the road, sat down on a wooden table, took out the food and the cooking gear and got the stove ready. I poured some fuel in it and following the instructions, I pumped it 20 times, opened the valve and put a match to the burner. Nothing. I pumped a bit more, making sure the I had previously turned the pump handle to the right position, but it still refused to light up. Then I noticed I had some fuel on my hand and quickly put out the match, images of my hand lighting up in flames flashing through my mind. It seemed that fuel was spilling out of the base of the burner assembly, where it attaches to the fuel canister. No warm meal then… I cleaned the spilt fuel, emptied the canister, put everything back on the bike and set off again in search of a place to have lunch, with my mood darkened. To make things worse, just a few kilometres down the road it started to rain. I wanted to find a roadside bar or café where I could eat and keep an eye on the bike, but there did not seem to be any nearby. After about 20 minutes riding I started to be quite hungry and my mood worsened, as it usually does when I have not eaten for a while. With the skies as dark as if it was night, I spotted a camp site by the river and pulled into it. Bingo! They had a small restaurant and sure enough, I could park the bike right in front of it. I got off and went for a meal without bothering to even remove the GPS from its cradle. With my stomach satisfyingly full, rode away and when I was climbing the TV-7411 road past Riba-Roja the sun came out and I enjoyed the beautiful view from the hills overlooking the Ebro river. 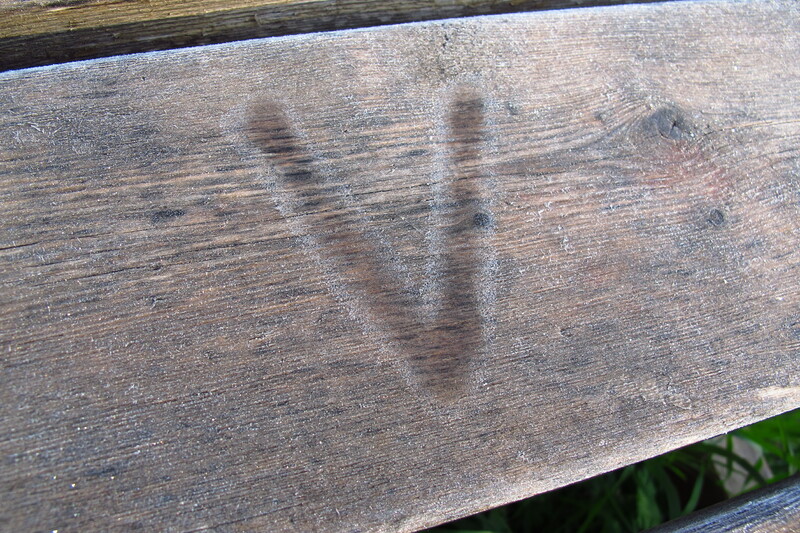 When I reached the top I saw a dirt road to the right of the road and a sign that read “Civil war fort and trenches”. 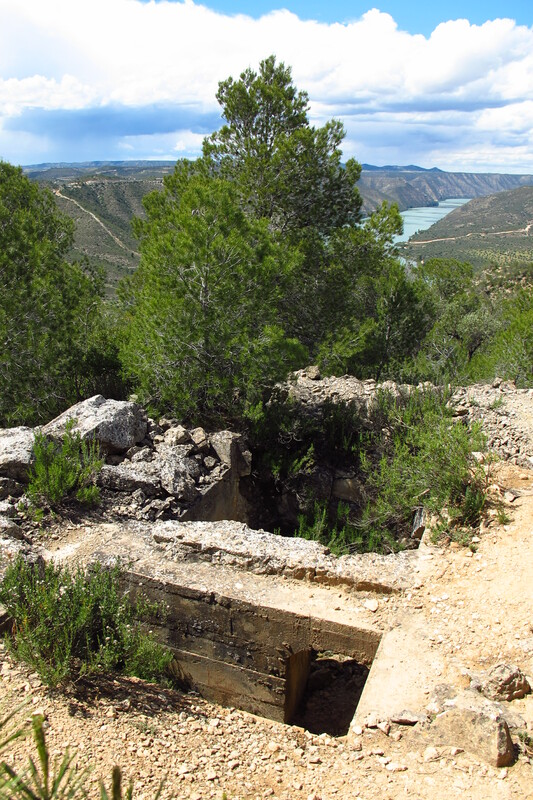 This area was where one of the worst battles of that time took place – the battle of Ebro – so I decided to visit that and get some more off-road practice. 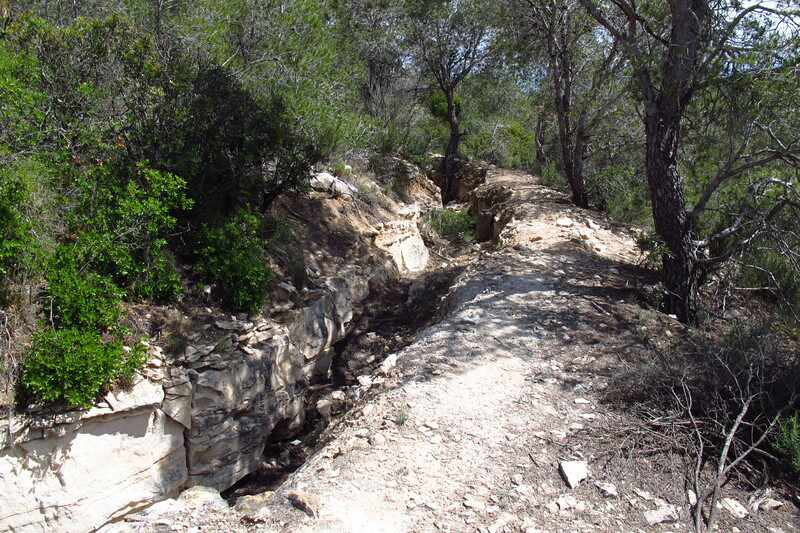 The track was about 2 km long, dry and rock this time, and I was more confident. I rode faster, standing on the pegs, and soon I had got to the end. There was a small car park, although I think a regular saloon might have had some difficulty getting there, and a small marked path leading around a ridge where the trenches and the remains of the fort were. The trenches were still easy to make out, but there was not much left of the fort, just a couple of concrete walls. From this position, the troops must have had a great view over the surrounding area and an advantageous position in battle. I found out from the explanation displays that a whole system of trenches and forts had been secretly built in that area to stop the national troops advance, but a lack of coordination and worse, of knowledge of the existence of the system, combined with a very rapid advance from the national troops meant that they were not put to good use. One can only wonder whether things would have been different if they had. When I got back on the bike I decided to test how it felt to ride with music on. I know this is illegal, at least in my country, but I very much doubt anyone cares in the middle of nowhere in Kazakhstan or Mongolia, and it is a good way to ward off boredom in long distances. It was a good moment to test it too, this part of the trip was taking me through some largely unpopulated areas, so the chances of being stopped by the police were minimal. I put the headphones on, turned the music up and rode the track back to the road. The moment was perfect: good music, great views… I got a bit carried away and rode the track faster than on the way there, and it was alright – both me and the bike managed it without any problems. A while later I got to a bigger road and stopped to remove the headphones and sent a message from the SPOT tracker. I had been testing it since I set off from Barcelona, sending check in and personalised messages, as well as tracking the route. I had considered buying a cradle to have it on the handlebars, but it was 20€ and the instructions said it had to be at least 12 inches from another GPS device, and it would have been another thing to remove from the bike every time I stopped, so I simply strapped it to my arm. It is comfortable and it gets signal without problems, so it is staying there. 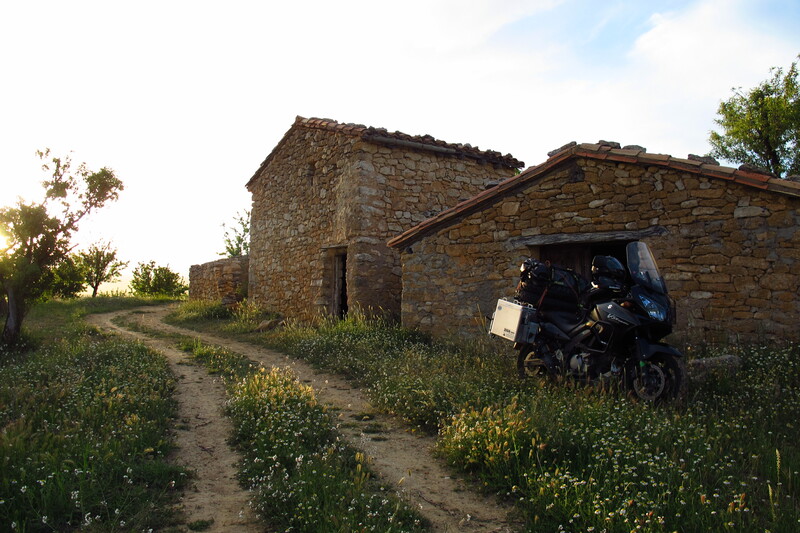 The road took me through Caspe, Alcañiz and to Calanda, where I turned off again, heading for the Sierra del Maestrazgo in search of smaller roads. This is an area of great natural beauty, and I enjoyed it thoroughly, riding up and down hills, on roads that had more potholes and patches than tarmac, seeing the sun break through the clouds. The GPS seemed to be working better and I switched from the Garmin European maps that came with it to the OSM ones I had downloaded. Both seemed to work fine, but there were roads that simply did not appear on either of them, so to the GPS I was riding off-road. After the last such road, I came out onto the N-420 and had to make a decision. 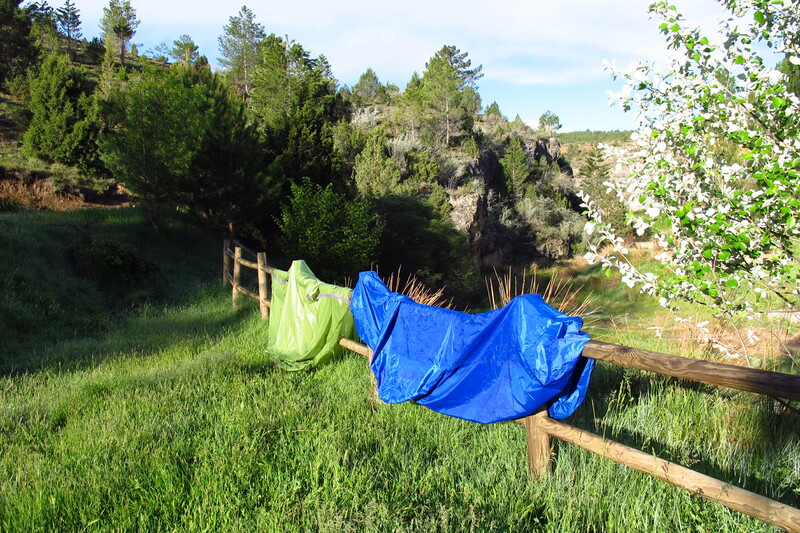 There is this small town south of Teruel where I sometimes spend my holidays, and I knew there were a couple of great camping spots. I really wanted to get there, but it was still far, and it was getting late. Not only that, there were menacing clouds in the sky, so I could either press on and try to get there before dark in time to set up camp, or I could try to find a place to sleep where I was. I decided to ride on. The roads were good here, long corners and smooth tarmac that allowed me to make good progress. Once I got there, I had to ride up a dirt track to get to where I wanted to camp. It was not raining when I turned off the road and onto the track, but it seemed it had been raining all day and the ground was muddy. I had a couple of scary moments, when the front wheel found soft mud and skid, but I was able to keep it under control and I got to the top of the hill just as the sun was setting. It was a fantastic spot, but the ground was rocky and muddy, and there was nowhere to put up the tent, so I rode back down the track – more carefully in the mud this time – and went to see if the second spot was better. It was, a nice field of grass next to a stream. 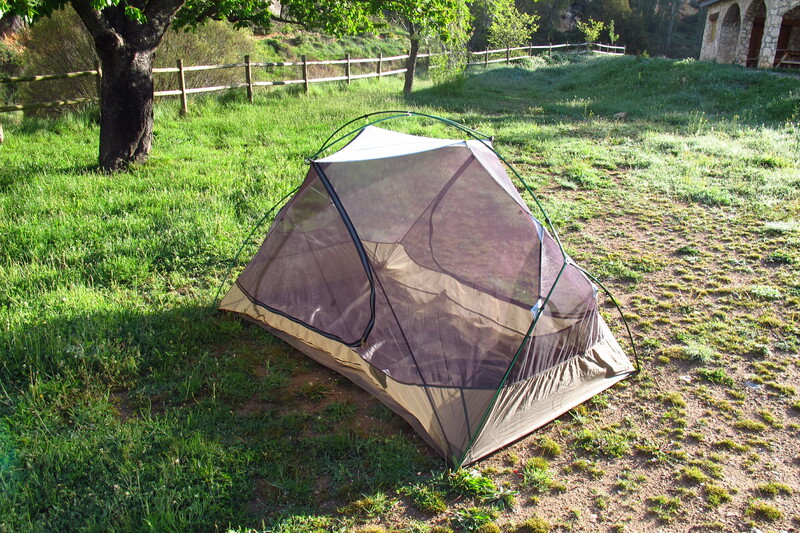 I got there when it was almost dark, and started putting up the tent on the grass. Fortunately it was easy and was quickly done, and by the time it was dark I had already finished and had dinner. What I did not have time to do, though, was clean and grease the chain and write this entry for the blog, I just went straight to bed. 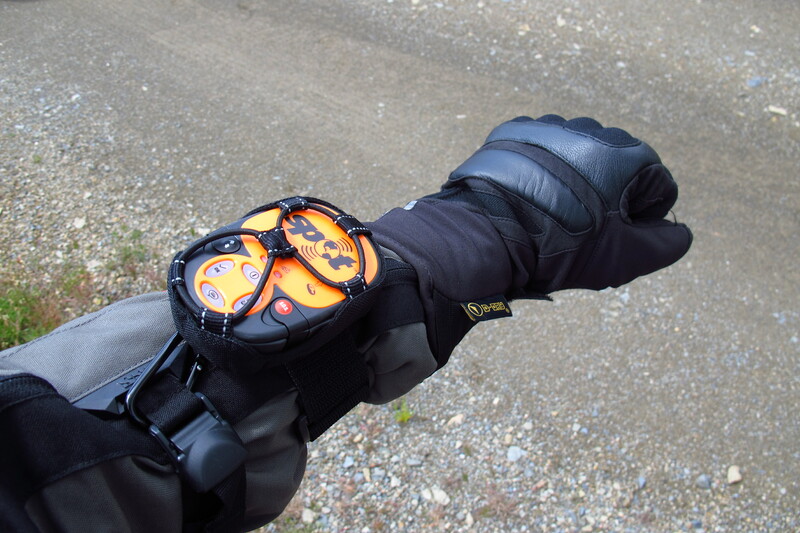 Sleeping well is important when you spend most of your day on the motorbike and have to do the same the following day and the next and the one after that, so I had tried to get a good sleeping system – I bought an ExpedSynMat 7 and a pillow pump. It was fast and easy to inflate, and much more comfortable than anything I had slept on in a tent before. The sleeping bag was a lightweight one from Decathlon – I had considered taking another one I already have that is warm at temperatures below zero, but I thought that I would only encounter those circumstances some night in Mongolia and most of the rest of time it would be rather hot, so I decided not to. However, I took a bivouac sack in case it got cold, and on this occasion, it proved to be useful. 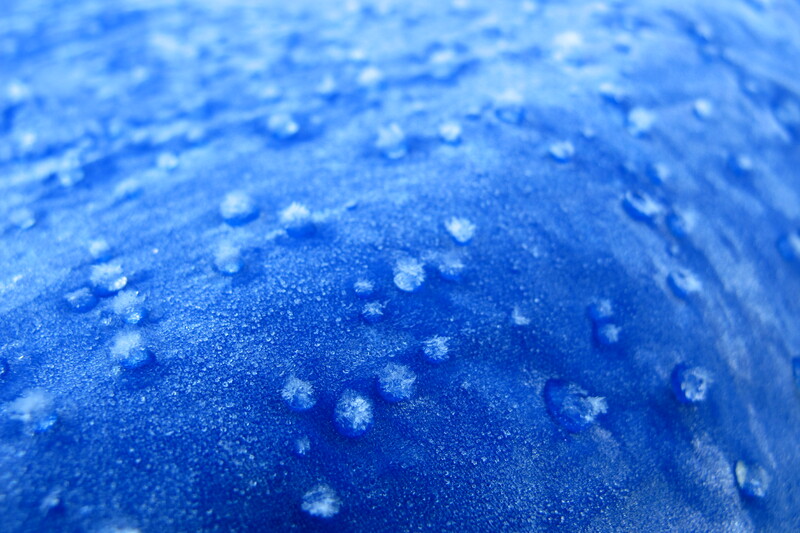 I slept in my thermal shirt and pants, and inside the sack, and managed to spend quite a good night, although my nose – I am endowed with quite a big one – stuck out and felt the cold so badly I woke up several times. 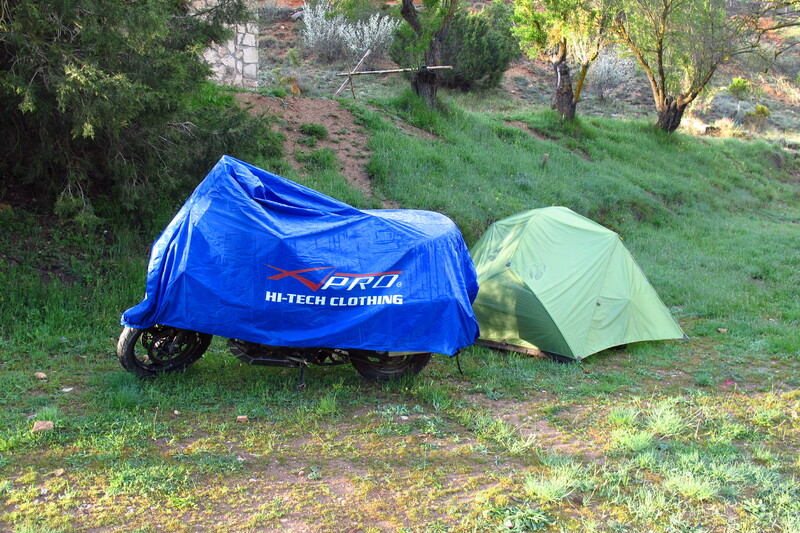 It did not rain that night, but in the morning the tent and the bike cover had a fine layer of frozen dew over them, so I had to hang them in the sun while I had breakfast to try and dry them a bit before packing. I got up at sunrise, so I had plenty of time to put everything back on the bike before hitting the road again. It feels great to get up knowing you have the whole day ahead of you, no work, no deadlines, no stress. Knowing that it would be another long day and that my stove did not work, I stopped at the first town I found, walked into a bar and ordered a huge sandwich to get the energy I needed. Happily fed, I started the way back. It was a glorious day, and I headed for the roads that crossed the forests over the hills between the area where I was and Teruel. 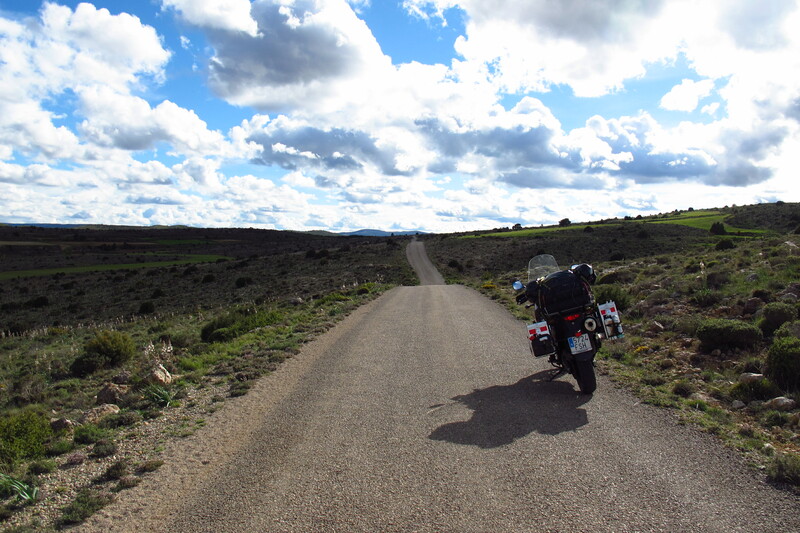 After about an hour riding through pine trees I arrived in Teruel and seeing that I was making good progress, I decided to take the small roads across the Maestrazgo region instead of taking the more direct way back. By the time I left the area and came down to Mequinenza it was 4 pm and I was starting to get tired of all the shaking and bumping on such bad roads, but I could not be happier. I had some bread and cheese for a late lunch and took the motorway for the last 200 km home. About a hundred kilometres from Barcelona I stopped at a service station and gave the bike a good pressure wash to get rid of all the mud it had accumulated over the weekend. Needless to say, five minutes later the skies opened and there was heavy rain all the way back home. I got to my parent’s at about 7 pm, it was still raining and I had to remove the panniers, the tires and the tire rack from the bike, put the top case back on to go to work on Monday morning and head home, all under the rain. When I finally got home I was exhausted, but happy to see that I was dry in spite of the rain, and more importantly, so was all my luggage. It was a long weekend – 670 km on the way there and 560 km on the way back, most of it on narrow, winding, potholed roads, some of it on dirt tracks and the last bit on the motorway, but it was perfectly doable and the stints I have planned for my trip are shorter than that. The motorbike has performed flawlessly and so has all the gear (except for the stove). I will relocate a couple of things for easier access and buy a few others (clothes line, another towel, a PacSafe net…) but overall the result of the weekend test is very positive. The bike and the equipment are ready, now it is time for me to get ready! I’ll need to work out this last month. This entry was posted in Stroming The World 2013, Travel by Kilian. Bookmark the permalink.